Yo! I’m Rhys and I work in the IT department here at Newydd. I hope this blog gives you a glimpse into all things computer-y, server-y, and anything in between. I’m also going to delve into some of the work we did on our new tenant portal, My Newydd. I’ve been working at Newydd for coming up to 2 years, having joined straight out of university. My job requires a lot of time spent at a computer. Therefore I try to spend as much of my personal time away from a screen, mostly for my eyes’ sake! I spend my time playing football and playing board games when I’m not in the office. 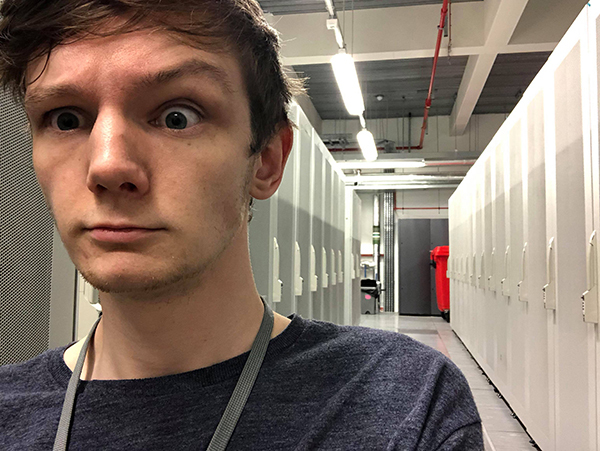 Here I am at our server rack in London, which you’ll learn a little about further down in this post. Our latest IT project is something you will hopefully already be aware of. We’ve re-branded and re-designed our online portal to help empower tenants. They can now manage their tenancy online at their own convenience. Despite being an IT project, My Newydd is not just the work of an IT department. It’s been the work of many departments working together. Which is what could be said of a lot of work that we undertake as IT. We often work with everyone around the organisation to help deliver IT services that people need, want and enjoy using. We set up a new server to get My Newydd up and running, which is located in London. This is where our internal internet connections break out to the world wide web. This server talks to our internal databases in the Newydd offices, which is how tenants are able to check their rent balance, log repairs and send Newydd messages (among other things). 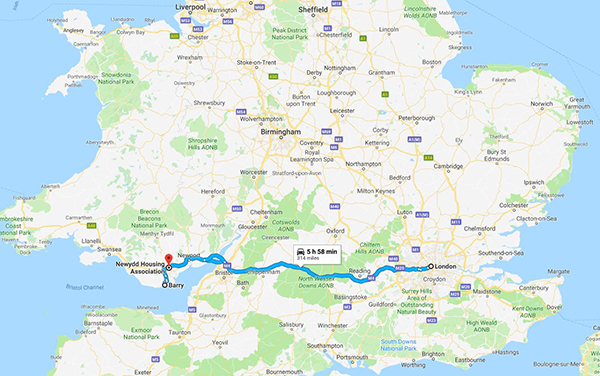 Anything logged on My Newydd will in fact do a 300-mile round trip to London before hitting our offices in Cardiff. These will be presented to our customer services department for them to respond to as appropriate. This way, tenants will always get a human response to anything they may want to talk to us about. There and back again… six hours by car. We had to run the site through testing to make sure every button and every page was behaving itself, and giving us what we wanted. It might come as a surprise to hear that one of the largest parts of IT’s work is performing tests. This is effectively the act of trying to break something in as many different ways as possible. This involved ensuring My Newydd worked on a tablet, phone or desktop, and on WiFi and mobile connections. It’s difficult to always account for every scenario, but that’s the nature of IT work. Our Marketing and Communications department helped us design the site. We needed to make sure we used the right branding, and most importantly, got the name right. We had a few candidates fly about the office: MyAccount, InNewydd and My Newydd. While we in IT ensured all the technical details were up and running behind the scenes, the portal also needed to look and sound right in order to make My Newydd a success. Our office debate for a name ended in a deadlock, so we ended up putting the name out to a poll on social media. The public chose My Newydd. 🌟 Introducing #MyNewydd. Manage your rent, repairs, personal details and messages all in one place. This is just the beginning of our digital journey. We hope to bring further functionality to the portal in the coming months, years and beyond. We’re hoping to improve the repair reporting process, offer new ways to engage with Newydd, and having tenancy agreements and other key documentation available on the portal. The portal should be the place to go for tenants to get what they want, when they want. We hope you like it! Signing up for My Newydd is quick and simple. There’s also a chance to win £100 every three months if you regularly use the service. Head to mynewydd.co.uk and click on ‘register’ to begin. If you’d like some help with using our digital services, head on over to one of our many #DoItDigitally blogs, such as Digital champions and Newydd online.